Published in Grass Roots Magazine 2014, and Live out Loud 2013. The loofa (Luffa cylindrical) is a wonderful plant for its diverse range of uses. 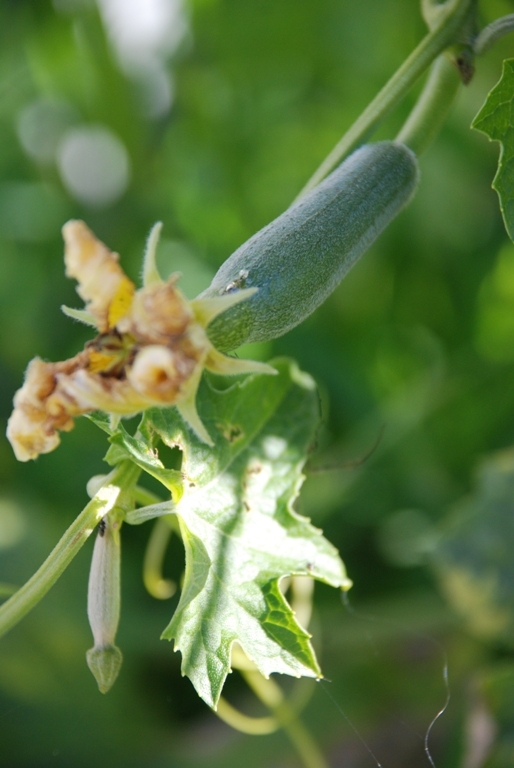 An annual vine of the Cucurbit family (related to pumpkins and zucchinis), it grows quickly over a trellis or fence, putting on a display of lush green furry leaves, yellow flowers and delicate tendrils. 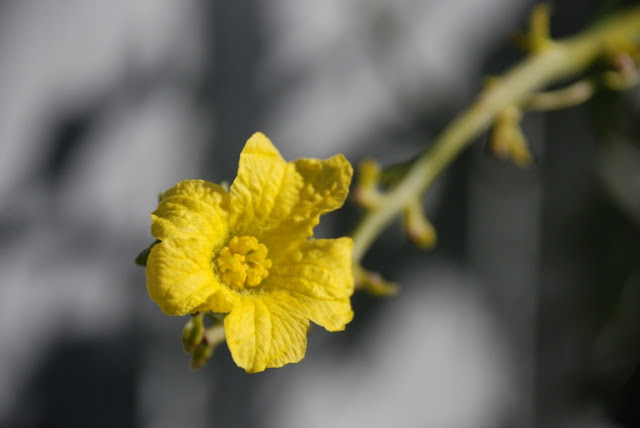 Commonly the plant is familiar as a bathroom sponge, made from the dried out mature fruit. It also makes for tasty eating if the fruit is picked young at approximately 10cm in length. The taste is similar to zucchini, but with a little extra pleasant tang. Prepare just as you would for zucchini. Last season I grew one in a pot. The plant thrived producing an armload of fruit. So it may be an ideal plant to grow as a screen on a balcony. Loofas are easy to grow; in spring, prepare a hole (or pot) with good compost and sow three seeds per hole. Seeds are available to purchase from heirloom seed suppliers such as Eden Seeds, or you can save your own from the previous seasons crop. When the seedlings emerge, discard the weaker two. 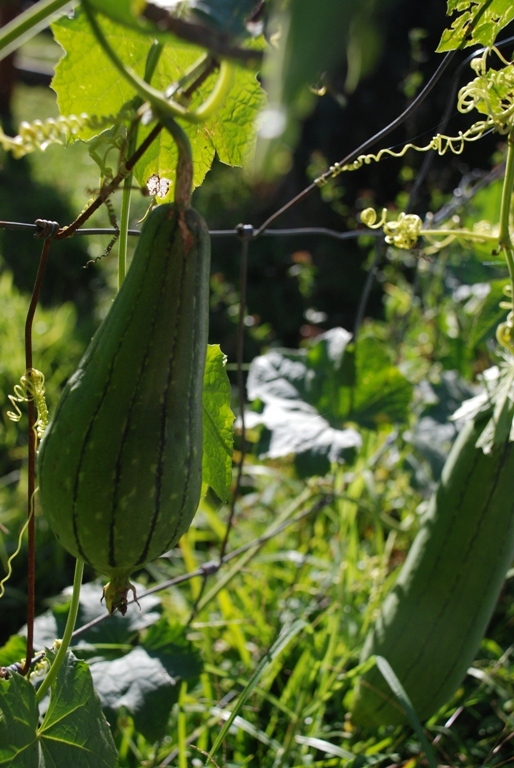 Loofas are one of the hardier members of the Cucurbit family. They are reasonably tolerant of a dry spell and exposed conditions, but for optimal performance keep moist. From my experience they are fairly resistant to powdery mildew that will often decimate pumpkins and zucchini, making it a good alternative. 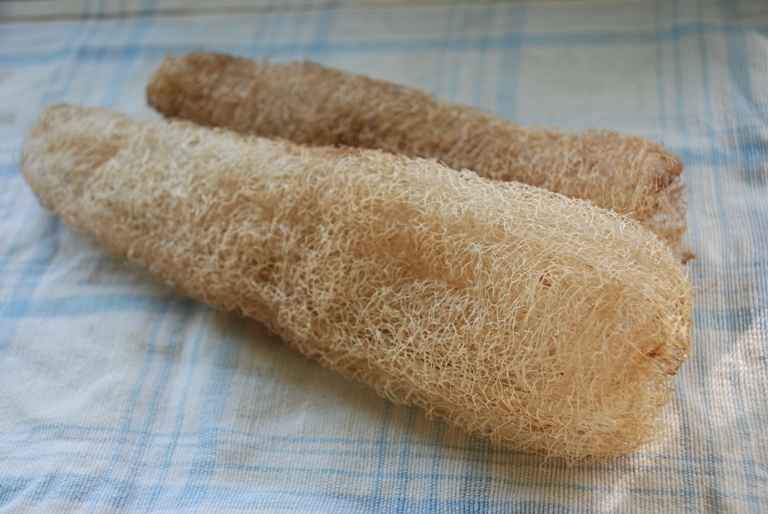 May and June are the months for harvesting the mature loofas to make into sponges. Most gardening books advise to leave the fruit to dry either on the vine, or picked and left undercover, before processing. However, in our climate they have a tendency to go mouldy and decompose. This season, determined to produce a lovely loofa sponge free from mould stains, I am picking and processing before the fruits completely dry. I picked a mature fruit (at about 25 – 30cm long) and left it to dry out for only a week on top of the fridge. The end of the fruit had just begun to turn black at this stage. If you wish to leave the fruit to dry completely, it will be ready when all the skin has turned black. The rest of the process is easy. Soak the fruits in a bowl of water overnight to soften the skin. Peel and squeeze out any remaining pulp. Hand wash in warm soapy water and leave to dry in the sun. Walla! You now have a beautiful homemade sponge. If your sponge has discolouration from mould, it can be bleached or dyed. To bleach, soak in diluted lemon juice, or hydrogen peroxide for an hour, then leave in the sun to dry. To add a splash of colour, place the sponge in left over water from either boiled beetroot or purple carrots. Add to the water just after cooking, when it is still hot, and leave to soak overnight. Rinse well and it is ready to use. Loofas make lovely handmade gifts. Dress them up with a plaited handle made from twine or wool, looped through the end of the sponge by making a small hole, and then knotting the ends of the plait together. Additionally the sponge can be used for general household cleaning, try it as a dish sponge.